Editor's note: Geek Out! posts feature the latest and most interesting in nerd-culture news. From sci-fi and fantasy to gadgets and science, if you can geek out over it, you can find it on Geek Out! Look for Geek Out! posts on CNN's SciTech blog. SPOILER ALERT: Do not read this interview if you haven't seen the most recent episode of "Lost!" Now that we have some sense of where Jacob came from - albeit only a vague one - "Lost" will return for two more episodes and hopefully answer some questions about the mysterious island, time travel, timelines, and more. We certainly have not seen the last of Benjamin Linus, nor do we know whose side he's really on anymore. CNN's Geek Out! chatted with Michael Emerson, who plays Ben Linus, about his experience on the show. We're told he'll have a larger role in this Tuesday's episode than the last two, in which he didn't appear at all. Although the audience feels some sympathy for Ben now, who knows how long that will last? CNN: Did you know when you first came on "Lost" that you would be a major character? Michael Emerson: No, thank goodness I didn’t know. It would have made me so nervous. I think I could have possibly screwed it up. As it was, I had no more nerve than you would normally have going to a strange show and doing a guest spot. I was only going to do a few, and then come home. I think I only packed for a month when I first went out there. Now it’s four and a half years later. What did you think when you read about the alternate universe in the script? Emerson: Like usual I said, "Well, how does that work, and what does it mean?" Then you start thinking, is it more real than the island narrative? Is it less real? Are they both equally real? Is one some kind of fantasy or dream, or possible alternative in the mind of the creator? You know, it’s still hard to know what a lot of things mean on the show. But also very exciting to me as an actor to get to make an entire second character without leaving the show of 'Lost.' He’s Ben, clearly, but a completely different version of Ben and that was one of the chief pleasures of the final season. How would you describe the difference between the two Bens? Emerson: It’s the same Ben but a different complete palette. The Ben of the island is in vivid primary color, and Teacher Ben is in more muted color, more like the real world. So, he has many of the same impulses, but in a much different amount. So, he has some ambition, but it’s a much smaller ambition. He has some sense of manipulation, but it’s a much milder, a much lighter version. That was what was fun about playing the flash sideways. Did anyone tell you what the flash sideways meant at the time? Emerson: No! No one tells you, but then we don’t really ask, either. For years, we’ve been doing this show, and mostly we just do it on faith. I don’t have to know exactly what it means to play it, if you know what I mean. I just show up, do my work, basically play it straight on the day, and then when I see it broadcast, a lot of times, then I’ll figure out what its meaning or context is. But sometimes not even then. Was there anything scary or weird to you in the show? Do you feel your character is inherently good or evil, or in a gray area? Emerson: He’s definitely in the gray area. He always was, but it’s even grayer now, I think. We’ve reached a place where I think he has a lot of audience sympathy at this point. It may not be permanent. But right now, we’re so much more familiar with him, and he’s definitely not the scariest creature in the show. At this point. (pause) Heh heh heh. Is there anything you wish your character had done on the show? Emerson: No, I don’t think so. I think it’s been really complete, and full, and consistent, and I’m very happy with the way Ben is resolved at the end. Tell us about a funny moment while filming. Emerson: I will always love the scene where Hurley and I shared a candy bar on a log in the rain forest. That was hilarious. We still talk about it because we keep analyzing it as if it were a comic bit, and we feel like it’s missing one beat to make it truly funny. What's a portion of the show you're particularly proud of? Emerson: I’m happy about the scenes where Ben … when the unhappy child in Ben reveals itself. When he gets angry or defensive or loses his customary control. There aren’t many of those kinds of moments. When Ben, for example, kills Jacob, that’s a place where all his adult civilization, he loses it for a moment. And the unhappy teenager … some part of Ben is frozen in development at a young age and never matured, and I like that about the character and I like playing it. Do you feel like your classical acting training helped you on this show? Emerson: Sure. I think that having done classical work is always a help. I just think it gives you … it’s a skill set. Once you’ve done that hard work of trying to crack open and illuminate difficult language, then contemporary language seems easier, and you can bring those more highly tuned skills to bear on texts that might not ordinarily seem exceptional, but you may be able to make it exceptional. How was it having your wife on the show with you? Emerson: It was fun. I love working with my wife [Carrie Preston, who was in "The Man Behind the Curtain" in Season 3], and it was unique to have her be in Hawaii working on the same show. We didn’t have any scenes together because she was playing my mother, so she had to give birth to a little baby me. It was kind of strange, but it was fun to go to the set, and she’d be clocking out, and I’d be clocking in. It was so crazy to go, "Hello honey, how was your day?” in the middle of this jungle. Did you do research for your character? Emerson: I always felt I had instinctively a grasp on this character. 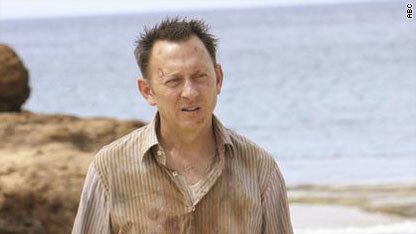 It wasn’t that much work to find how to play Ben Linus. But again, I was glad that I have played villains on stage. You play a part like Iago in Othello, and that gives you some ideas about the function of villains in drama, and how they tick, and what makes them exciting for an audience. It was useful that I had the stage background that I do. Are you friends with other cast members? Emerson: I hang out a lot with Terry [O’Quinn] and with Jorge [Garcia]. Jorge throws a lot of fun parties at his house so I’m over there a lot. And Terry and I –we’re such a happy acting team that we just get along famously. We’re of similar age and similar background, and I have enjoyed my collaboration with him. Any plans for acting after Lost? Emerson: I don’t have anything lined up yet. Something will come, I assume. I’ll be happy if I can do some theater work this year, probably New York, I don’t know what it will be or when. I’ll continue to audition for movies, maybe I can get a little part in a movie some day, and that would be fun.